The Minister for Foreign Affairs and Trade hosts an annual Reconciliation Networking Forum which brings together a wide variety of community and voluntary groups who work in the field of reconciliation. The Reconciliation Fund awards grants to organisations working to build better relations within and between traditions in Northern Ireland, between North and South, and between Ireland and Britain. The Reconciliation Fund Strategy 2014-2017 was launched on 9th June 2014. The strategy outlines the priorities for the Reconciliation Fund, ensuring that the Fund supports our vision of a reconciled Ireland and remains relevant, effective, and efficient in the coming years. The Department is now working on an updated strategy, for launch during 2019. For those wishing to apply in the current funding round which opened on 26th March, please note that applications must now be submitted online by the extended closing date of 14:30 pm on Tuesday 16th April. Any organisation still intending to apply in this round will therefore need to submit their request to register for an account on the grant application portal by 12 midday on Monday 15April, so that the Reconciliation Fund Team can approve their registration in sufficient time to allow the application to be made by the Tuesday 16th deadline. For full details please check out the 'How to Apply' tab below. Please note that details of our second funding round of the year will be posted to this website during the summer. Any queries in relation to the Reconciliation Fund may be submitted by email through the link at the bottom of this page or by calling the Department of Foreign Affairs and Trade’s switchboard on 00353 (1) 4082000 and asking for Reconciliation and Commemorations section in the IUKA Division. We give funding to non-governmental organisations (NGOs), community groups, and voluntary organisations to support reconciliation and to create better understanding between people and traditions on the island of Ireland and between Ireland and Britain. The Reconciliation Fund has been running since 1982, and was increased significantly in 1998, following the signing of the Good Friday Agreement. The Department of Foreign Affairs and Trade operated an Anti-Sectarianism Fund in addition to the Reconciliation Fund in the period 2008-2014. Since 2014, in accordance with the Reconciliation Fund Strategy, the two funds have been merged into a single Reconciliation Fund. Anti-sectarianism is now mainstreamed throughout the entire programme and is one of a number of priority areas to be addressed by the Fund. The annual budget for the Reconciliation Fund was approximately €2.7 million in 2018. In May 2018, the Tánaiste and Minister for Foreign Affairs and Trade Simon Coveney T.D. announced that the Reconciliation Fund’s budget would be increased to €3.7 million from 2019 onwards. Academic research where the primary purpose relates to promoting reconciliation. These areas of work will remain deliberately broad to remain accessible to a wide range of organisations and projects. The funding environment for the particular sector. We provide grants on a once-off basis, but organisations may apply for funding in successive years or funding rounds. Funding is generally awarded for project activities, but a contribution towards core running costs (salaries and overheads) and capital costs will also be considered, where they are directly attributable to the project or programme for which funding is sought. 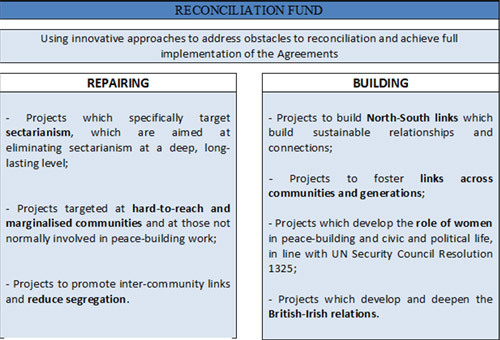 Where such costs are not directly related to particular projects, a contribution may still be considered if it is clearly demonstrated in the application form that the primary focus of the organisations’s work is in the area of peacebuilding and reconciliation, in line with the objectives of the Reconciliation Fund. We do not generally give grants for events/activities that have already taken place, or travel off the island. 1. Before you apply for a grant, you have to become a registered user of the Grant Application Portal. Appendix 1 in the User Guide lists the categories of information you will be asked to provide during the initial registration process. We recommend that you review this list and arrange to have the required information to hand before you begin to enter data on the portal. 2. During this initial stage where you register to become a user of the Portal, your information can only save to the system once you have clicked submit at the end of the registration request. Therefore, to ensure that any data you enter here is not lost, we strongly recommend that you complete this initial registration process in one sitting. You will have a maximum of 3 hours to complete the process before you are timed out (with loss of data entered). The system is designed to retain your information on screen for that 3 hour period, but depending on how your own device is set up, if you pause and leave the device during that time, you run the risk of being timed out by your device, losing the data you have input and having to start the registration process again. The best way to ensure no loss of information is to complete the registration process in one sitting and before the 3 hours elapse. 3. During the application stage (following registration as a user), information has to be entered in a series of tabs. You can sign in and out and complete this process in stages, but if you do not complete the Tab you’re on and click Next at the bottom of the screen, the data you entered under that tab will not have saved when you sign back in. If you pause during the application process but do not sign out, you will be automatically timed out of the Portal after 20 minutes of inactivity. Again, if you are timed out without having clicked Next on the current tab, data you entered on that tab will be lost. If you are applying for €10,000 or more in a 12-month period, you must submit a valid Tax Clearance Certificate with your online application. This certificate is issued by the Irish Revenue Commissioners. Obtaining a tax clearance certificate is a very straightforward process and it can be done by email. If your organisation is resident in the State you should be able to apply online for a tax clearance certificate. Fax number: 00 353 61 401012. Detailed information is available at www.revenue.ie. The TC1 form is an application form that must be sent directly to the Irish Revenue Commissioners, and not to the Department of Foreign Affairs and Trade. You must submit a report to us once the project has been completed or within 12 months of the date of receipt of the grant (whichever is the earlier date). You must also send us the annual accounts for the organisation. If the grant is over €12,500, the organisation’s accounts must be externally audited. Our grant must be clearly listed as a separate entry in the accounts, labelled as: Department of Foreign Affairs and Trade – Reconciliation Fund. Reports should not be submitted through the online applications system. They should be emailed directly to the Reconciliation Fund team through your regular point of contact. Download the full list of grants awarded in 2018 under Tranche 1 of the Reconciliation Fund 2018 and Tranche 2 of the Reconciliation Fund 2018. Download the full list of grants awarded in 2017 under Tranche 1 of the Reconciliation Fund and under Tranche 2 of the Reconciliation Fund‌. Download the full list of grants awarded in 2016 under Tranche 1 of the Reconciliation Fund and Tranche 2 of the Reconciliation Fund. Also available is the press release accompanying the Minister’s announcement of this Tranche 1 of funding. Download the full list of grants awarded in 2015 under Tranche 1 and under the Strategic Partnership scheme of the Reconciliation Fund, and under Tranche 2 of the Reconciliation Fund. Download lists of the grants awarded in 2014 under Tranche 1 of both the Reconciliation Fund and Anti-Sectarianism Fund, and under Tranche 2 of the Reconciliation Fund. Download lists of the grants awarded under the Reconciliation Fund and Anti-Sectarianism Fund in 2013. Download lists of the grants awarded under the Reconciliation Fund and Anti-Sectarianism Fund in 2012.